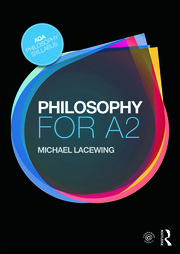 Michael Lacewing is Reader in Philosophy and Vice-Principal Academic at Heythrop College, University of London. He grew up in India, and studied at Manchester, Oxford, and Reading universities before joining Heythrop in 2001. Michael’s philosophical interests lie in the overlap between ethics and mind, in particular, psychoanalysis. Michael Lacewing is Reader in Philosophy and Vice-Principal Academic at Heythrop College, University of London, where he teaches Ethics, Philosophy of Mind, and Philosophy of Psychology. He grew up in India, and studied at Manchester, Oxford, and Reading universities before joining Heythrop in 2001. Michael’s main philosophical interests lie in the overlap between ethics and mind, in particular, psychoanalysis. One of the world's leading authorities on philosophy of psychoanalysis, he is currently co-editing The Oxford Handbook of Philosophy and Psychoanalysis for Oxford University Press. Michael has been involved in A level philosophy since 2003 (see www.alevelphilosophy.co.uk), and has completed training in Philosophy for Children with SAPERE (www.sapere.org.uk). From September 2017, he starts as a teacher of Philosophy and Theology at Christ’s Hospital School. He is on the Executive Committee of the British Philosophical Association, the association for philosophy in British higher education, advising on matters related to philosophy in schools.